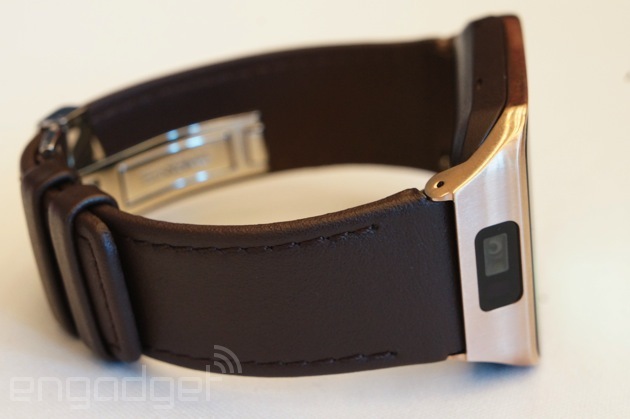 Samsung's new Gear smartwatches are no longer card-carrying members of its Android Galaxy. That's because Tizen, the company's open-sourced OS, has taken over the reins for the line begot by the barely five-month-old Galaxy Gear. And, in typical Samsung fashion, the company hasn't released just one new Gear, but three with very specific areas of focus: the fashionable Gear 2, the functional Gear Neo and fitness-focused Gear Fit. The newly announced trio was on display here at Mobile World Congress in Barcelona, giving us a chance to get acquainted with their particular quirks and let you know whether or not to free up some space on your wrist. Based on looks alone, it's obvious the Gear 2 is Samsung's new smartwatch flagship. The device not only surpasses its stripped down sibling, the Neo, with the inclusion of a camera just above its 1.63-inch watchface, but it also boasts an all-metal enclosure and removable leather strap. This is in contrast to the Neo's all-over colorful, plastic design -- though it, too, features a swappable strap and even designer support from the likes of Moschino and Nicholas Kirkwood. Their spec differences aside, both the Gear 2 and Neo feature 4GB of internal storage, 300mAh battery, an inbuilt IR blaster (paired with Samsung's WatchOn app) for controlling your TV, IP67 rating for water-resistance, Bluetooth 4.0 for connecting to a portable media player and heart rate monitor (located under the watch face) to aid with fitness-tracking. That latter health-focused bit even goes as far as "coaching" users, via haptic feedback, to increase or decrease their exercise rate. So how do these two new Gears differ cosmetically from the original Galaxy Gear that inspired them? For starters, Samsung's done away with the exposed metal screws of the Galaxy Gear's front face in favor of a sleeker, seamless finish that gently blends into the band. The home button has been moved to a prominent position just at the base of the touchscreen, while the camera and/or IR blaster (depending on the Gear model) reside just above the top edge. The Gear 2 and Neo also sport a bit of user customization, as both now offer a multitude of wallpaper and font options. As for their charging cradle, Samsung didn't have any on-hand to show off, but we've been told they'll be different than that of the OG Galaxy Gear's. Then there's the Gear Fit. In this trio of Samsung smartwatch amigos, it's kind of the oddball, what with its 1.84-inch curved Super AMOLED display (432 x 128) and narrow focus on health and wellness. The Fit, like its Gear siblings, also features a swappable strap, Bluetooth 4.0 and an IP67 rating for water-resistance, except its battery is rated for longer use at up to four days. Of the bunch, it's definitely the most physically attractive Gear option and the one we could really see users embracing. There'll be no shortage of apps for consumers that plunk down for any of these new Gears. Samsung has stated that it now counts over 100 dedicated apps for its Gear line and with the availability of its open SDK, that number is poised to expand even further. Of course, Samsung's offering a means of getting to these third-party Gear apps easily via its own curated app store. As for its own pre-loaded selection, Samsung's made it so that users will have access to the same stable of apps on Samsung's Gear 2 and Neo: Notifications, Logs, Dialer, Contacts, Pedometer, Exercise, Heart Rate, S Voice, Media Controller, WatchOn Remote, Apps and Settings. While the Fit ditches the IR blaster- and phone-focused apps for the narrower suite of Notifications, Media Controller, Pedometer, Exercise, Heart Rate, Timer, Stopwatch and Settings. You're probably wondering when we can expect to see these new Gears hit retail and just how much each is going to cost. Those are both good questions we, unfortunately, don't have the answer to right now. Samsung would only go on record to say that the Gear 2, Neo and Fit would be available sometime in April, but that still leaves a giant question mark hovering over their respective prices. While that essential bit's currently an unknown, we'd bet that, given the breadth of this new Gear line, you can expect there'll be a range of affordability.